Ask an American to name a giant of automotive history and they will probably name Henry Ford first. And rightly so – Henry Ford wasn’t just a giant of automotive history, he fundamentally changed business in the United States in the 20th century. Ask the same question to a European and you might get some Henry Ford answers. But you’re more likely to get the name of Rudolf Diesel, the man who rightly deserves his place alongside Henry Ford in automobile design history, in a similar fashion to Nikolai Tesla vs. Thomas Edison. Diesel was of German descent, but born in Paris in 1858 to immigrant parents. His family was actually deported when the Franco-Prussian war broke out in 1870. His parents settled in London but asent young Rudolf to Germany to study at age 12, where he quickly proved to be a prodigy. By age 22, he had graduated from university in Munich, having put himself through school on merit scholarship because his parents would not pay for his further education (they thought he should have stopped school and gotten a real job. Just kidding). Young Rudolf even had to battle a bout of typhoid before graduating. He got work as an engineer in a refrigeration plant in Paris, and took over as plant manager within a year. While working at the plant, he makes numerous developments resulting in the granting of many patents. Life is going well, except for the fact he can’t use his own patents because the company takes ownership of them. At the same time, Rudolf is becoming interested in engines and fuel efficiency. He builds a new kind of prototype steam engine which explodes and puts him in the hospital for a period of months. But he’s not deterred because he’s got a bug about something – he thinks that he can make a new kind of engine that blows away anything else when it comes to fuel efficiency. Engines in the late 1800s were models of inefficiency. They only used about 10% of the energy they produced; the rest was wasted through their inefficient design. Diesel thinks he can do much, much better. Up to 75% fuel efficiency instead of 10% or 20% (thought to be fair, a mechanical engineer will tell you that fuel efficiency and energy efficiency are different things, but you get the point). His case is convincing enough that he even gets some financial backers and sets up a manufacturing plant. He is now in his early 30s and things are looking up. Turns out, Rudolf Diesel was right about his ideas. His working models of the “Diesel Engine” developed and went out into the market between 1893 and 1897. And they revolutionized the world. They became the standard engine design in heavy machinery and railroads and marine applications. Rudolf Diesel becomes extremely wealthy as a result of his revolutionary engine design. In case you’re wondering, the diesel engine works by “compression ignition” instead of a spark plug. Fuel goes into a combustion chamber where it mixes with air and awaits combustion. In a gasoline engine, the fuel needs to be ignited, hence the use of a spark plug. But a diesel engine relies on compressing the fuel-air mix, making it hotter (because of Boyle’s Law in physics) and essentially enabling it to self-ignite. It’s a simpler design as you can probably tell, much more efficient and even generates more power and torque (which makes it ideal for heavy load engines like the ones above). 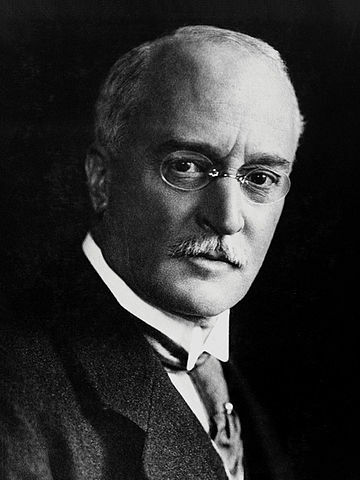 Rudolf Diesel is also at least semi-famous for the mysterious circumstances surrounding his death at the age of 55. He is sailing to London on the ship Dresden in 1913. He eats dinner and retires to his cabin at 10 pm, leaving instructions for a wakeup call at 6.15 am. But he is nowhere to be found. His bed hasn’t been slept in and all of his personal belongings are right where they should be. His hat and coat are neatly folded and put away, and his watch is even right there on the nightstand where it could be seen from the bed. Ten days later, the crew of another boat report finding a decomposed body floating in the North Sea near Norway. They retrieved personal effects from the body that seem to indicate it was Rudolf Diesel’s body. But the crew neglected to bring it on because of its decomposition. In the end, Rudolf Diesel was never seen again. So what happened to him? Some think he committed suicide. Others think he was murdered by nefarious industrial forces from the coal industry, as Diesel’s new engine severely damaged their business. Another theory is that Diesel was murdered by the German military or the German Secret Service – he had refused to grant the German army exclusive rights of use for his diesel engine design. In addition, it is known that the reason Rudolf Diesel boarded the Dresden ship was because he was on his way to a meeting with the British Royal Navy to discuss the possibility of British submarines being powered by diesel engines. But the evidence is limited for all of these theories. One final wrinkle is that before he left, Rudolf left his wife a bag and instructions not to open it until a week after he had departed. Upon opening, she discovered the bag was filled with $1.2 million (200,000 German marks) and financial statements showing Rudolf Diesel had emptied all their bank accounts and put the money in the bag for her. And in his diary, on the day of his disappearance, Diesel himself had drawn a cross in the date entry. Whether that means he knew he was going to meet his demise by his own hand or by someone else’s, we will never know. This post was published on May 26, 2018 and was updated on June 11, 2018.